When you get a free lifetime supply of something at the aggressively ripe age of 100... it's just kind of a rip-off. Even at World Record-levels of longevity, you'd only be able to use your newfound power for 15, maybe 20 more years. 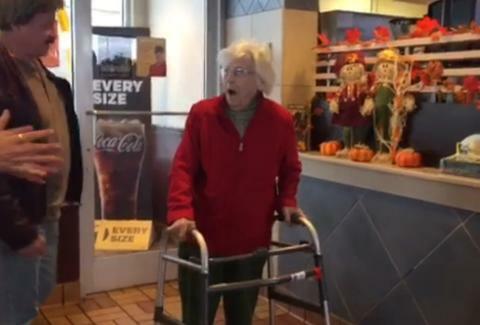 But due to an overwhelming amount of adorability (it's OK, that's a real word), the gift of a lifetime supply of free McDonald's recently bestowed to Hanover, Maryland-resident and centenarian Nadine Baum simply can't be ignored. Baum and her son frequented the Golden Arches in South Hanover for years before arthritis made it extremely difficult to leave the house... even for nuggets. So when team members at the location found out Baum would be hitting the century mark, they decided to make this birthday memorable... which is hard when you've literally had 100 of them. McDonald's crew member Ginny Slaubaugh, who ran point in setting up the surprise party, said she had come to know Baum closely after her daily visits, even calling her Mom, according to the initial report by The Evening Sun. The celebration included donuts, balloons, and a certificate allotting a lifetime supply of free food from Micky D's. "I don't know what I did to deserve all this," Baum said to the Sun. "I count my blessings every day." This is a heartwarming story and all -- but let's think about the logistics here. Is McDonald's the secret to her unusually long lifespan and relatively excellent health? Does the certificate go to next of kin in the event of death? Does it cover just her food, or her friends? Do I still have time to win over Nadine's good graces, and possibly sweep her off her feet in the name of free McGriddles (they serve 'em all day now!)? These questions are probably best left unanswered. Ultimately, I'm just happy a sweet lil' old lady like Nadine Baum is happy.